Room for both in the British Isles? Step into the glittering royal court of France, the bitterly cold winter of Scotland, and the push-pull relationship between Mary Queen of Scots and her cousin Queen Elizabeth I in this fascinating novel filled with intrigue, plots, and danger. Which royal person’s story most fascinates you? 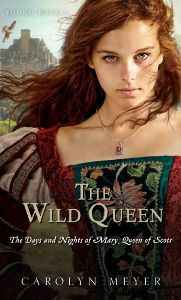 Book info: The Wild Queen: The Days and Nights of Mary, Queen of Scots (Young Royals series) / Carolyn Meyer. Houghton Mifflin Harcourt, 2012 (paperback, 2013). [author site] [publisher site] Review copy and cover image courtesy of the publisher. My book talk: Mary’s daring gamble for the Scottish throne could be her last royal act, but the risk is worth the reward. Sent to France as a very young girl to be raised in the royal court and become wife of Francis I, Princess Mary is merely a bargaining chip to her ambitious relatives. When widowed at age 18, Mary vows to rule over her homeland of Scotland as is her right, no matter who stands in the way. However, she is not the only royal woman in the British Isles to master statecraft and subterfuge; her cousin Elizabeth is prepared to keep Mary’s ambitions from affecting her own reign, at any cost.